Generates a two colored swirl of light along a user controlled spline reminiscent of the Aurora Borealis (Northern Lights). Background: The current layer. The clip to use as background. Mask: Defaults to None. Defines the area where aurora should be rendered. Mode: Popup menu, Default: Aurora . Aurora: creates an aurora along a spline. Follow Path: creates an aurora along an AE Path. Start: X & Y, Default: [-0.7 0.4], Range: any. The starting point of the Aurora. Point 2 Enable: Check-box, Default: on. Control Point 2: X & Y, Default: [0.04 0.2], Range: any. Control Point 3: X & Y, Default: [-0.1 -0.4], Range: any. End: X & Y, Default: [0.8 -0.5], Range: any. The ending point of the Aurora. Path To Follow: Default: 0, Range: 0 or greater. AE path for the Aurora to follow. Start Color: Default rgb: [0 0.8 0.3]. Sets the color at the starting control point. End Color: Default rgb: [0.6 0.2 0.8]. Sets the color at the ending control point. Color Phase: Default: 0, Range: 0 or greater. Adjusts the phase of the gradient between Start Color and End Color. 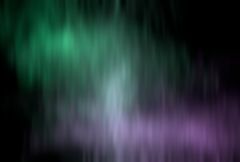 Use this to animate the movement of the colors along the Aurora. Stroke Size: Default: 0.25, Range: 0 or greater. Influences the width of the Aurora along the spline. This parameter controls the size of the underlying color gradient before it's distorted. Brightness: Default: 0.3, Range: 0 or greater. Scales the brightness of the Aurora. Softness: Default: 0.075, Range: 0 or greater. The amount of blur applied to the Aurora. Set to 0 to get a colored point cloud. Softness Rel Y: Default: 10, Range: 0 or greater. The relative vertical amount of softness. Swirl Complexity: Integer, Default: 3, Range: 1 or greater. Specifies how many layers should be rendered in the Aurora. The more layers rendered, the more complex pattern generated along the spline. Swirl Magnitude: Default: 0.7, Range: 0 or greater. The magnitude or amplitude of the swirls along the spline. Setting this to 0 will render a color gradient along the spline. Magnitude Rel Y: Default: 1.25, Range: 0 or greater. The relative vertical magnitude of the swirls. Swirl Frequency: Default: 2, Range: 0 to 50. The frequency of the swirls along the spline. Frequency Rel Y: Default: 10, Range: 0 or greater. The relative vertical frequency along the spline. Swirl Speed X: Default: 0.1, Range: any. The speed at which the swirls move horizontally. Swirl Speed Y: Default: 0, Range: any. The speed at which the swirls move vertically. Light Brightness: Default: 1, Range: 0 or greater. Lights a circular area of the Aurora. Set to 0 to disable the light. Increase value to increase the intensity of the light. Light Pos: X & Y, Default: [-0.3 -0.5], Range: any. The position of the center of the light. Ambient Light: Default: 1, Range: 0 or greater. The level of illumination outside the light. Light Radius: Default: 1, Range: 0 or greater. Distance from the center of the light to the edge of the brightest section. Light Softness: Default: 2, Range: 0 or greater. How quickly the edge of the light should taper off of to darkness. Determines how the Aurora is combined with the source image. Screen: the Aurora is blended with the source using a screen operation. Add: the Aurora is added to the source. Aurora Only: gives the Aurora with no source. If this value is positive the output Alpha channel will include some opacity from the aurora. The maximum of the red, green, and blue light leak brightness is scaled by this value and combined with the Background Alpha at each pixel. Turns on or off the screen user interface for adjusting the Start parameter.This parameter only appears on AE and Premiere, where on-screen widgets are supported.